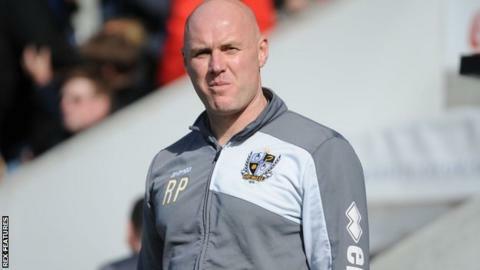 Port Vale manager Rob Page admits making the League One play-offs are now a "long shot" but says his side could still finish in the top six. Vale's 1-0 defeat by Barnsley on Monday left them eight points off the play-off spots with six matches to play. "People will write us of now," Page, 41, told BBC Radio Stoke. "But there's no pressure on us so let's go and relax, enjoy the last six games and surprise a few - that's been my message to the players." Eleventh-placed Vale have played a game more than Barnsley, who are one place outside the play-off places, and two more than the four sides immediately below them. Although realistic, Page remains hopeful that Vale can quickly end their three-game winless streak and put together a decent run. "Is it a long shot? of course it is," Page said. "We'll need a bit of luck but we're going to give it everything we've got and if we win more than we lose, we might drop lucky. "We've got Chesterfield on Saturday and we're looking forward to bouncing back."